CAMBRIDGE, Mass.–(BUSINESS WIRE)–SIRION Biotech International Inc., a wholly-owned subsidiary of SIRION Biotech GmbH in Germany (“SIRION”), offering the most comprehensive portfolio of custom viral vectors for preclinical and clinical studies, today announced the grand opening of a new office at 125 Cambridgepark Drive, Suite 301, Cambridge, Massachusetts 02140. 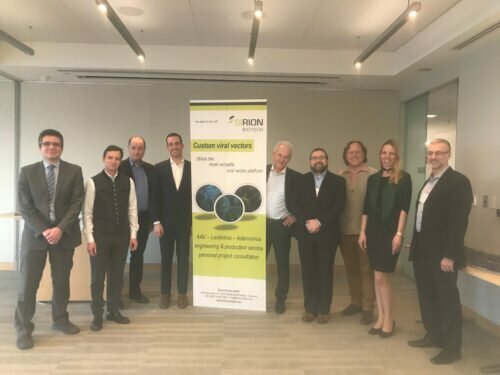 SIRION was pleased to meet its new neighbors last night when it hosted a Bavarian-themed grand opening event at the Forsyth Institute to meet and mingle with the Cambridge gene therapy scene. World renowned gene cell therapy developers and viral vector experts talked about the importance of the right viral vectors in making gene therapy a reality. Gene therapy has seen strong clinical advancement, and SIRION is becoming a partner of choice in this growing sector as demonstrated by recent deals with Denali Therapeutics, Orchard Therapeutics, and an additional, undisclosed alliance with a major public company that is advancing the discipline.